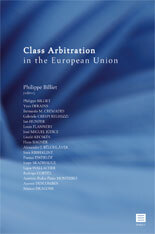 This book is the first publication to deal with the subject of class arbitration in the European Union. It investigates to what extent class arbitration (either US style or a European variant) may take place in Europe and to what extent class arbitral awards are enforceable in European jurisdictions such as France, the Czech Republic, Denmark, Hungary, Italy, Portugal, Spain, Sweden, United Kingdom, Belgium and The Netherlands. The authors are amongst the world’s leading arbitrators and academics in the field of arbitration. This volume serves as a critical study for shaping future practice and setting out future rules, policies and guidance in relation to class arbitration and collective remedies. It is an indispensable addition to every ADR practitioner’s library. Contributions by: Philippe BILLIET, Yves DERAINS, Bernardo M. CREMADES, Gabriele CRESPI REGHIZZI, Ian HUNTER, Louis FLANNERY, José MIGUEL JÚDICE, László KECSKÉS, Hans BAGNER, Alexander J. BELOHLÁVEK, Sara RIBBEKLINT, Pontus EWERLÖF, Jeppe SKADHAUGE, Lajos WALLACHER, Rodrigo CORTÉS, António Pedro Pinto MONTEIRO, Aurore DESCOMBES, Matteo DRAGONI. Philippe Billiet (editor) is a lawyer at Billiet & Co and frequently appointed as arbitrator by various national and international ADR centres. He specializes in cross-border civil and commercial disputes and is a mediation trainer for the EMPTJ training program. He lectures in ADR (including comparative arbitration laws and dispute settlement in China) at the Brussels VUB University. The Association for International Arbitration (co-editor) works towards the promotion of alternative dispute resolution (ADR) and strives to bring together the global community in this field, including judges, lawyers, arbitrators, mediators and academics as well as research scholars and students.